There are robots roaming the aisles of Walmart and other grocery stores. Monitoring inventory, cleaning up spills and potentially replacing workers. Automation is coming to a supermarket near you. We rolled out several new technologies over the last year and talked about the "connected store" where many of the technologies will be communicating to each other. Rolling out these technologies to hundreds of additional stores confirms our commitment to innovation. These innovations allow our associates more time to focus on serving the customer, the technology is used to complete those repetitive and mundane tasks like cleaning floors, checking inventory, price changes, unloading trucks and tasks that simply take time. We don’t discuss the cost involved for each technology for competitive reasons. Regarding our associates and hours, what we’re seeing so far suggests investments in store technology are shaping how we think about turnover and hours. The technology is automating pieces of work or tasks (rather than entire jobs). As that’s happening, we have been able to use many of the hours being saved in other areas of the store — focused more on service and selling for customers. We have now added over 40,000 jobs for the online grocery picking role in stores over the last year and a half. These jobs didn’t exist a short time ago. The result so far: We’ve seen our U.S. store associate turnover reduced year-over-year. So we do expect some hours will be pulled over time for some of these repetitive rolls, but EITHER through attrition (someone leaving the company for whatever reason) OR through reinvestment into the store, we will try to absorb those pulled hours into different roles that didn’t exist a few shorts years ago. Like the online grocery picking role. Also, important to keep in mind, the tasks being automated are generally things that we struggle to find, hire and retain associates to do. As we’ve started changing the job to take out some of that routine work, it’s becoming easier to find people to do those jobs. Wall Street Journal: "Walmart Is Rolling Out the Robots" — "Walmart Inc. is expanding its use of robots in stores to help monitor inventory, clean floors and unload trucks, part of the retail giant’s efforts to control labor costs as it spends more to raise wages and offer new services like online grocery delivery. "The country’s largest private employer said at least 300 stores this year will add machines that scan shelves for out-of-stock products. Autonomous floor scrubbers will be deployed in 1,500 stores to help speed up cleaning, after a test in hundreds of stores last year. And the number of conveyor belts that automatically scan and sort products as they come off trucks will more than double, to 1,200. "The company said the addition of a single machine can cut a few hours a day of work previously done by a human, or allow Walmart to allocate fewer people to complete a task, a large saving when spread around 4,600 U.S. stores. Executives said they are focused on giving workers more time to do other tasks, and on hiring in growing areas like e-commerce." 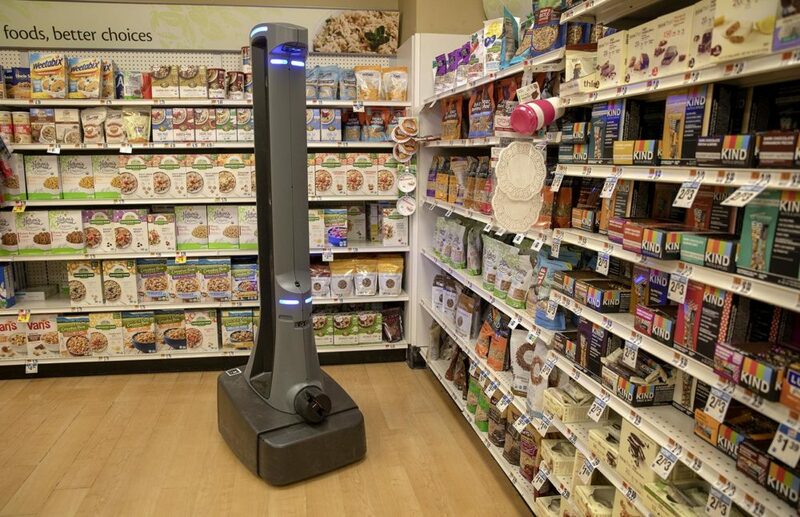 WBUR: "Cleanup On Aisle 9: Robots Arrive At Grocery Stores Near You" — "Stop & Shop's parent company, the Dutch food retailer Ahold Delhaize, has started deploying robots named Marty to more than 100 Massachusetts locations. "Marty, a six-foot-tall pillar with googly eyes, roams the stores, beeping gently as it scans the floor for trash and spills. "At a Stop & Shop in Quincy, Marty spots a fallen price tag in front of a shelf of Easter candy. The robot's cameras take a picture, which is then sent to a worker hundreds of miles away at a facility run by the company TaskUs. The worker looks at the picture to confirm the problem, then Marty alerts customers and store employees. "'Caution. Hazard detected,' Marty says, playing the pre-recorded message in English and Spanish. "A Stop & Shop employee scoops up the tag and presses a button to send Marty on his way." "Tall, slow-moving and gray, he has big cartoonish eyes that disguise something unique about the newest employee at Giant Food Stores: Marty is deliberate and relentless, and — unlike his fellow employees — he has the ability to work a seemingly endless number of hours without pay. "After a pilot program that kicked off in several Pennsylvania stores this past fall, Giant Food Stores announced Monday that it will place Martys in each of the supermarket chain’s 172 stores across Pennsylvania, Maryland, Virginia and West Virginia. The robotic rollout is part of a plan by Giant’s parent company, Ahold Delhaize USA, to deploy about 500 robots to stores such as Giant, Martin’s and Stop & Shop. The robots will begin arriving “in waves” over the coming months, according to Giant, which expects to have the devices fully deployed in about six months." This program aired on April 11, 2019. Does Artificial Intelligence Need A Code Of Ethics?